Turkish Airlines has just dropped the price of their non-stop flights from Toronto (YYZ) to Istanbul, Turkey (IST) down to $555 CAD roundtrip including taxes. What's more, some early summer dates are a part of the drop (late June to early July). The pic is from Cappadocia, Turkey. If you go to this magical place, definitely do a hot air balloon trip. and September, October, November 2016. They can also be booked through Expedia.ca for $6 more. toronto, yyz, flight deals, europe, southern europe, eastern europe, asia, southeastern europe, istanbul, turkey and ist. 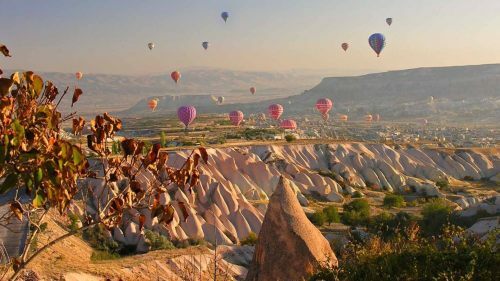 3 Responses to "Toronto to Istanbul, Turkey - $555 CAD roundtrip including taxes | early summer travel and non-stop flights"
Can someone please confirm if this deal is still available on any of the listed dates? Not totally surprising, as this was posted over 2 weeks ago. You may want to sign up for the YYZ Deals alerts to be notified when a new deal is posted.